The Holden ute is close to being an aussie icon, almost akin to football, meat pies and kangaroos. But where does the good old aussie ute fit in today's world? The North Americans abandoned this type of ute some decades ago, to make way for more and more of the larger truck style utes. The Europeans have rarely embraced sedan-based utes of Commodore size. Whilst the South Americans have a distinct preference for smaller, more fuel efficient utes. The Asian market has little interest in our locally designed utes. So the market for aussie utes is basically Australia and the traditional small volume export markets in New Zealand, South Africa and the middle east. However, the times keep changing and the Holden ute does too. In an endless pursuit to improve fuel economy and in a desire to offer alternative fuel sources, Holden has released the dedicated LPG version of the Commodore VE Series II range a few months ago. With a 'car park' of approximately 750,000 LPG-fuelled vehicle across the nation (2008 estimate), there is going to be interest in LPG for some time to come. Although LPG vehicle sales have been in decline, there is steady improvement at the present time. For example, 680 LPG-fuelled passenger cars were sold during H1 2011 but that increased to over 1,700 in H1 2012. We take the recently released dedicated LPG-fuelled Holden Commodore Omega utility for a week of suburban motoring. Although we didn't get the tray dirty, we managed to appreciate the attributes that only an aussie ute can offer utility drivers. Yes, the car-like comfort and driving qualities of the Omega ute is a significant improvement on that offered by other types of utility vehicles. The base price* for the Holden Commodore Omega utility with dedicated LPG is $37,990. Metallic/prestige paint (such as the Nitrate coloured test car) adds $550 to the price. Holden utes have been around for longer than many aussies! Over the years they have proven their worth, although the Japanese style ute has won favour with many tradesman and recreational vehicles. Towing heavy loads has moved people into the truck-like utes too. But that said, there is still good demand for the traditional Holden ute and that includes the second-hand market, too. Today's Holden utes offer petrol and ethanol (E85) fuelled engined and now dedicated LPG is available in place of the previous dual-fuel arrangement. The Commodore Omega ute is available in a choice of just four colours. There are two standard colours (white and red) and two optional colours (silver and black). Our 165 kilometres was solely urban driving in which our fuel consumption averaged 16.71 litres per 100 kilometres. LPG vehicles burn more fuel than petrol engined vehicles so we are not surprised by our consumption figure. Of course, with LPG being cheaper and cleaner than petrol, the advantages are noticed in the wallet and in the atmosphere. The Omega ute is just like an Omega sedan really. That equates to being comfortable without any luxury. It just motors around the suburbs at a leisurely pace whilst providing decent driving dynamics and without complications. The ute is big and I found it difficult to judge the rear bumper location when reversing. A rear-mounted camera would have been handy. The interior lay out of the Omega is pleasant and all controls are easily available. At its price level, the Omega ute is a good choice for those requiring comfort with load carrying capacity. As LPG isn't available in take-away cans, drivers of LPG-fuelled vehicles must ensure they don't run-out of fuel. Otherwise, a tow truck is their only option. Powered by a front-mounted 3.6 litre, six-cylinder (3,564 cc), LPG-fuelled engine, the test car came complete with 180 kW (at 6,000 rpm) of power and 320 Nm (at 2,000 rpm) of torque. 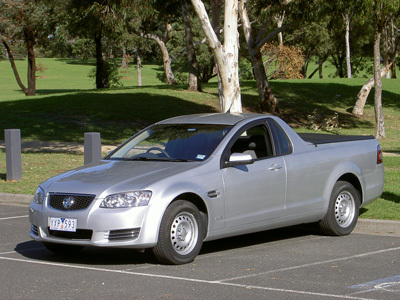 The Commodore ute is rear-wheel drive. The transmission is a six-speed automatic. There are no powertrain or drivetrain options with the LPG ute. 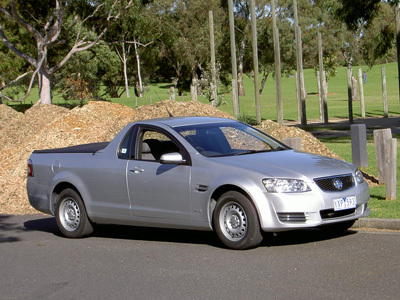 The Commodore Omega LPG ute is rated 5 stars by ANCAP for crash worthiness. This is good! In fact, it is very pleasing to see a ute with a five-star safety rating. 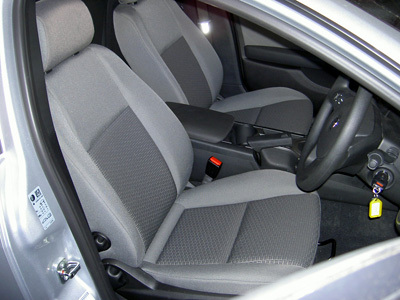 Standard equipment for Omega utes include dual-stage airbags for driver and front passenger; side impact airbags for driver and front passenger; side curtain airbags; passenger seat child restraint anchor point; seat belt warning; front seatbelts with load limiters and pyrotechnic pretensioners; and electronic stability control (ESC) incorporating: anti-lock braking system (ABS), electronic brakeforce distribution (EBD), electronic brake assist (EBA), traction control system (TCS). On the combined cycle, fuel consumption of the LPG Omega ute is rated at 12.4 litres per 100 kms, compared to 9.6 litres of petrol per 100 kms for the 3.0 V6 petrol-fuelled Omega ute. With LPG being cheaper than petrol, it is easy to do the maths to check on dollar savings as it relates to the individual's typical mileage. As mentioned, our purely urban motoring averaged 16.7 litres per 100 kms. The fuel tank capacity is 84.4 litres (petrol models have a 71 litre tank). CO2 emissions are rated at 200 grammes/kilometre on the combined cycle (229 g/km for the 3.0 litre V6-petrol Omega ute). Standard equipment includes adjustable steering wheel (height and reach); trip computer (with: average fuel consumption, average speed, digital speedometer, distance/time to go, fuel used/range, odometer/trip meter/trip time, visual and audible speed warning); multifunction steering wheel controls (for sound system, trip computer, Bluetooth® (for compatible mobile phones); single CD player able to play MP3 tracks; USB input; iPod® (for compatible devices); two cup holders in centre console; centre console storage compartment with armrest lid; auxiliary power socket in console; grey cloth covered driver and passenger bucket seats; soft tonneau cover; four 16" × 7" steel wheels with 225/60 R16 tyres (a spare wheel is optional); tyre sealant and air compressor kit; four-wheel disc brakes; air conditioning, automatic headlights and cruise control. 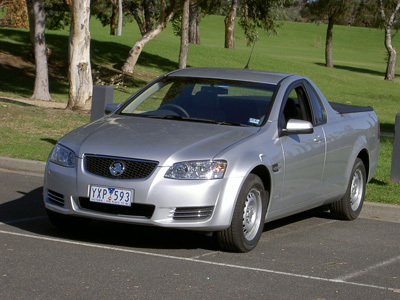 Holden offer the dedicated LPG-fuelled V6 ute in two models, the Omega (as tested) and as the sporty looking SV6. The towing capacity of an appropriately equipped Omega ute is 1,600 kg for a braked trailer (auxiliary cooling package required). Amongst utilities, the Holden Commodore is foreman material. That is meant, of course, as a compliment. This aussie ute is a good example of how a worker's vehicle can still be hospitable and a pleasant, non-stressful driving experience. It maintains a strong Australian tradition and offers more comfort than the Japanese style utes. The dedicated LPG fuel source makes it easier on the environment than a petrol fuelled version. It offers good economic sense as well. And the 5-star safety rating is excellent. The Holden Commodore Omega utility with LPG is a good drive, I enjoyed the comfort and ride qualities.